Do you name every single animal on the farm? Do you have some sort of naming system? Each month, we ask you to share your questions about farming, food or Sacrewell with us on Facebook. The person who writes the best question wins a free family admission pass for a day at the farm, as well as having their question answered on our website. This question came from Azra Akhtar’s daughter. Some of the animals at Sacrewell have names, but some of them don’t. This is the case on most farms. On a commercial farm where hundreds of animals are being born, bred and sent to market each year, it doesn’t make sense to start giving each one an individual name. However, it is often important for farmers to be able to identify and keep track of individual animals, especially if they are moved from one farm to another. One method of doing this is to attach ear tags to the animal which carry an individual number. The tags cause no more pain to the animal than an earring does to a human. 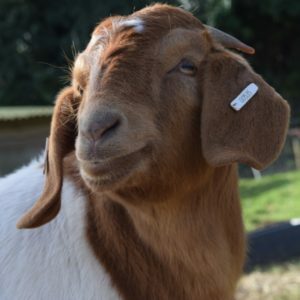 You can see them in the ears of most of the sheep and goats at Sacrewell, though the mischievous goats sometimes get them caught in bushes, fences or trees and the tags can be torn out. The pigs on the farm are pedigree British Landrace pigs, so there is a strict system for keeping track of them which ensures we can easily work out the parents and grandparents of each individual pig. Pedigree piglets are registered with the British Pig Association using their mother’s name and a number. The first male piglet in the first litter that a sow has will be number 1 and each subsequent piglet from that same sow will be given the next number in the sequence. The numbers are tattooed onto the ears of our piglets before they are weaned from their mother. This process causes no more pain to the animal than a human getting a small tattoo. Our Boer goats and Lincoln Longwool sheep are also pedigree animals, but they use a slightly different system of naming. This photo of the goat’s registration certificates shows how the system works. 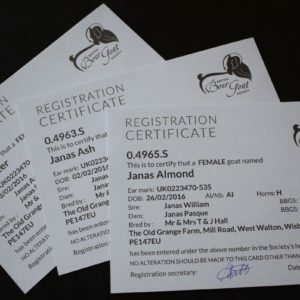 Ash and Acer were born at the Old Grange Farm, which uses ‘Janas’ as a first name for all of its goats. The second name then starts with a different letter each year. Ash, Acer and Albert are the first Boer goats that we’ve had at Sacrewell so their second names all start with an A. We’re hoping to have some Boer kids on the farm in 2018, which will be given the first name ‘Sacrewell’ and a second name starting with the letter B.
We’ve also given names to some of the other animals on the farm which are bred for working rather than meat and therefore they’re at the farm for a much longer period of time. We don’t have a system for naming these and sometimes ask for suggestions from the public, though our animal team always have the final say. Examples of these include Tramp and Luna the Shetland ponies, Jolly Joules and Dicky Mint the donkeys and Rosie and Jess the farm cats.